With more than 100 years of successful experiences, Gretsch-Unitas (G-U) is a leading supplier of automatic entrance systems, windows and door technology, as well as building management systems. Here you will not only find an unrivalled selection of products ranging from window hardware for single- family homes through to complex building management systems – this is also the right place for your a one stop system solution needs. 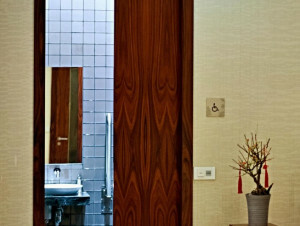 We have designed and developed an intelligent toilet door system for the handicapped and disabled use. We call it “Handicapped Toilet System”. A physically challenged person simply waves his hand near the contactless switch to gain entry into the toilet. The system makes a clear audio announcement during the operation of the sliding or swing door, even when it is occupied. Safety is of the utmost importance thus we use safety light curtains instead of safety beam, to prevent any impact on the user while the sliding door is closing. Our intelligent system automatically extends the hold time of the door while there is user entering the facility, and closes the door immediately after the user leaves. In the unlikely event of a user being trapped inside the toilet, a manual overwrite key switch can be used to open the door. Other accessories that can be integrated to the system includes a nurse call pull cord, emergency door release unit and a monitoring sensor which resets the system automatically after 10mins of user inactivity in the facility. To lock the door, we adapt a “motor locking” concept using by voltage. This will prevent permanent locking due to mechanical fault. Our eco-module saves energy by turning off the light automatically when the facility is not in use. The lights will be turned on again when the door is activated to open by any users. Our self monitoring function will never lock up an empty facility, preventing anyone from using it. Our system is extremely quiet during operation and tested up to 2 million cycles certified by TUV SUD PSB Singapore.